1. A very brief description of the two major methods of growing strawberries today. Publications outside the focus of this publication are also referenced for both small-scale and commercial growers looking for chemical pest control guidance. 2. A discussion of the strawberry plant disease anthracnose. The fungus Colletotrichum is responsible, with the species C. acutatum being predominant. The progression of infection is discussed, and pictures of anthracnose infection on each of the strawberry plant parts and the strawberry itself are presented. Also discussed are the conditions in which anthracnose thrives, how to prevent its spread, and how to avoid contamination. 3. A discussion of the strawberry plant disease gray mold, which is the most common strawberry fruit rot. It is caused by the fungus Botrytis cinerea and is very common due to the fact that it is spread via the air. The parts of the strawberry plant most commonly affected are discussed. Also discussed are how to prevent infection, varieties resistant to it, and optimal spraying times. 4. A discussion of the strawberry plant disease leather rot, which is caused by Phytophthora cactorum. Strawberries infected with leather rot can appear normal while tasting bitter. Foods made from these strawberries would be unpleasant (bitter jams or jellies). How to avoid infestation is presented along with photos of infected fruit. 5. Strawberry plant leaf diseases are also reviewed. Leaf blight, leaf scorch, common leaf spot, and angular leaf spot are discussed. Pictures of each are presented to aid in the correct diagnosis. The causative organisms are also listed. The specific parts of the leaves where infestation is most common is mentioned as well as the climactic conditions that are favorable to the causative organisms. crown rot (Phytophthora cactorum), and Verticillium wilt (Verticillium alboatrum). The conditions in which these infestations flourish are discussed as are the symptoms of infection. Photographs of strawberry diseases are present. 7. A table of commonly grown strawberry varieties in Tennessee is useful for quickly determining strawberry resistance and susceptibility to the various pathogens previously discussed. If you are interested in learning more about strawberries and diseases, see the Strawberry Plant reference page. 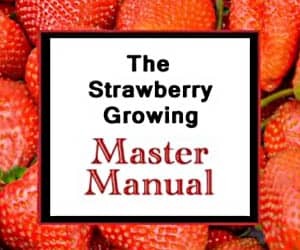 To learn more about specific cultivars, see the Strawberry Varieties reference page. To find out which strawberry variety would grow well in your area, see here: Recommended Strawberry Varieties by State. Thanks for your help. In the end, most of the Seascape ended up dying, however the Sequoia have survived OK. Of note is that the Seascape that were somewhat shaded by a Kale plant, and more away from the edge of the raised bed survived. Your website is amazing! Thank you! I am hoping you can help me better understand my strawberries. I’m in the SF Bay Area (70’s to low 80’s in day, evenings in the 50’s) and I planted Sequoia and Seascape from bare root early this year. We had a wonderful first harvest, but then we got a bunch of rain. After that the plants got “leather rot.” I diligently cut away the bad strawberries and pruned, and also watered carefully. But I didn’t get more strawberries, so I added some worm compost (home made). Now most of the plants look lush and green, but I’m not see many berries at all. I can’t figure out if this is because they are still diseased, OR if it’s just because strawberries that are ever-bearing “take a break” in between seasons. It sounds like you are a very diligent green thumb! Congratulations on a first harvest! To answer your question, yes, there is usually a delay between harvests for everbearing varieties. There is usually a first large crop at the beginning of the season followed by a smaller crop toward the end. Day-neutral varieties typically produce straight through, but they have fewer and smaller strawberries, in general. So, give your plants a while longer, and you will probably have another smaller harvest later on. Good luck! Often, the tips can be malformed if you have insect or mite infestations that are feeding on the plants. If you look in the Strawberry Library, there are several resources that can help you identify and treat your strawberries’ malady. Sometimes, with some varieties, the tips just take a bit longer to ripen, even if there are no pest problems. Good luck!